June 14, 2015, dawned bright and sunny, but true to the weather forecast, did not stay that way. By 11:30 am, sprinkles of rain were growing in abundance but the optimistic organizers still packed cricket, volleyball, Frisbee, horseshoe and other game gear together with food in the hope that the weather would improve and not be as projected. 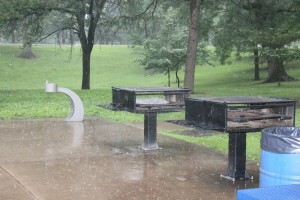 By 12:30 pm, several strong downpours proved the folly of their optimism and rain restricted outdoor activities till the picnic ended at 4 pm (some did stay that long). 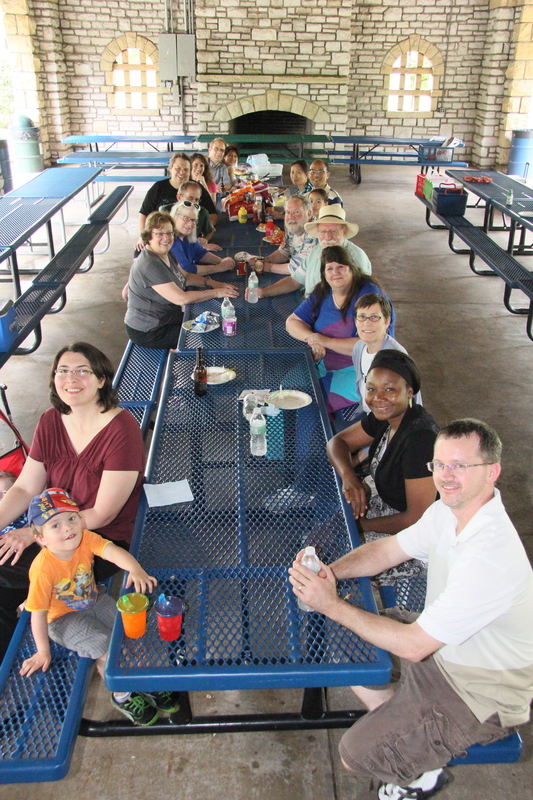 Weather notwithstanding, a pleasant time was had by all who attended; some 25 members and their families enjoyed conversing, networking and striking up new acquaintances with old, current, and new faces. 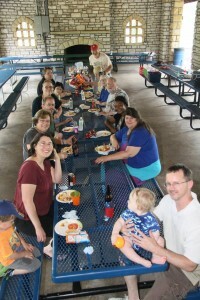 The picnic had an Australian theme: shrimp-on-the-barbie with a mango relish. 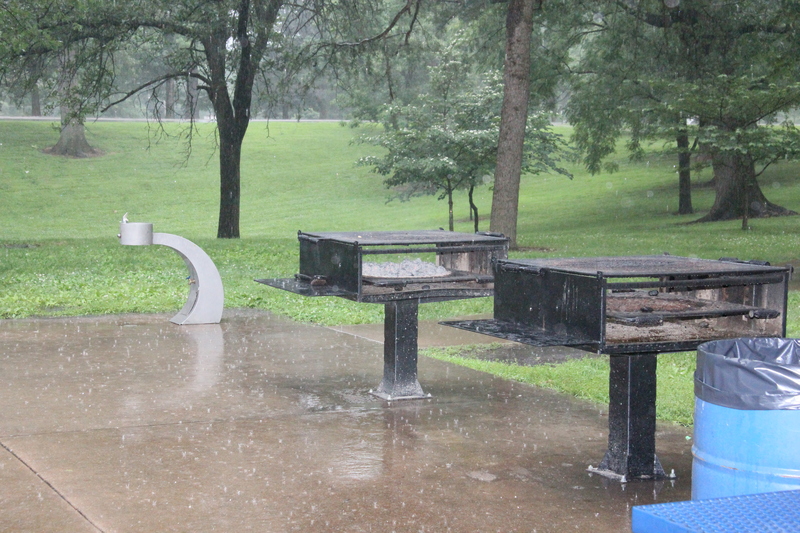 Margaret Allen averted a crisis by going off in the pouring rain to purchase a supply of brats when it was discovered by the organizers that that particular must-have for a BBQ had been left at home. 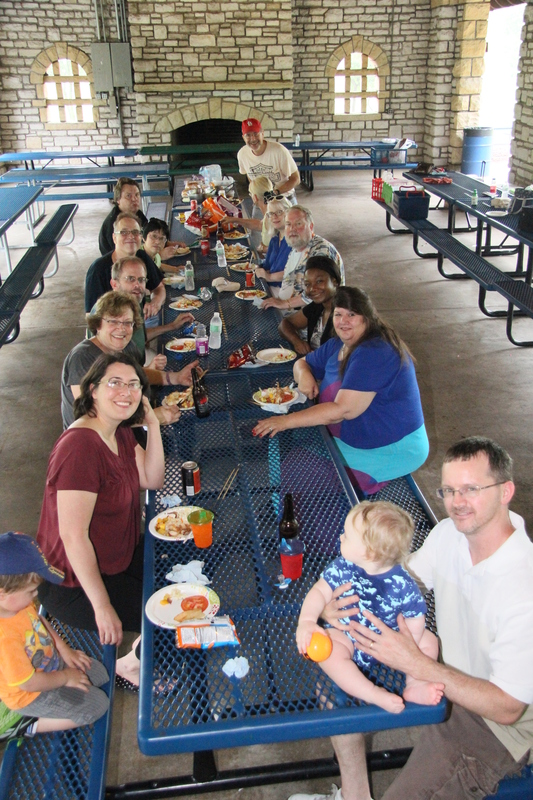 STL-ACS annual picnic 14 June 2015, rain did not stop a delicious BBQ! and this photo captures the rain, rain and more rain! 1st Place Honors 9-12, Joshua Leib Kazdan, Grade 11, John Burroughs School, St. Louis, MO. 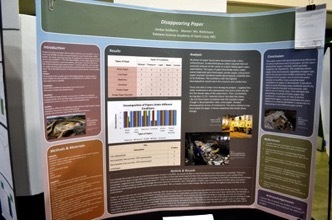 Second Place: Jordan Sedberry, “Disappearing Paper,” Grade 10, Gateway Science Academy, St. Louis, MO. 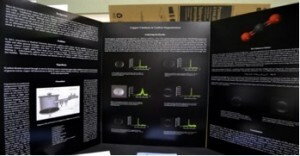 2nd Place Honors 9-12, Jordan Sedberry, Grade 10, Gateway Science Academy, St. Louis, MO. 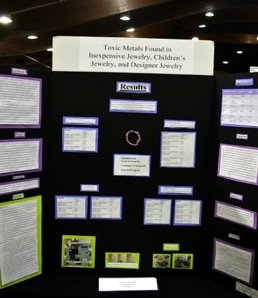 Third Place: Rebecca Serrano, “Toxic Metals in Inexpensive Jewelry,” Grade 12, Cor Jesu Academy, Saint Louis, MO. 3rd Place Honors 9-12, Rebecca Serrano, Grade 12, Cor Jesu Academy, St. Louis, MO. First Place: Maggie Morse and Natalie Rath, “The Effect of Antacids on Difference in pH of Stomach Acid,” Grade 10, Parkway West High School, Ballwin, MO. Third Place: Susan Albarcha and Yasmine Khan, “The Effect of the Types of Protein on the Temperature at Which They Denature,” Grade 10, Parkway West High School, Ballwin, MO. 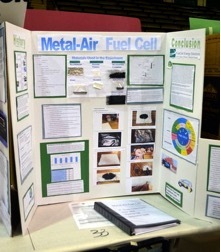 First Place: Christopher Collver, “Metal-Air fuel cell,” Grade 8, Southwest Middle School, Ballwin, MO. 1st Place Grades 6-8, Christopher Collver, Grade 8, Southwest Middle School, Ballwin, MO. 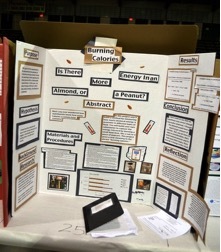 Second Place: Maryam Noor, “Is there more energy in an almond or a peanut?”, Grade 6, Al- Salam Day School, Ballwin, MO. 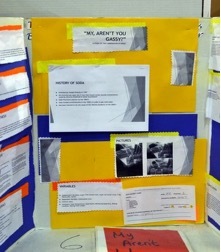 2nd Place Grades 6-8, Maryam Noor, Grade 6, Al- Salam Day School, Ballwin, MO. Third Place: Alex Meyer “My aren’t u gassy: A study of carbonation,” Grade 7, McKinley Class Leadership Academy, St. Louis,MO. 3rd Place Grades 6-8, Alex Meyer, Grade 7, McKinley Class Leadership Academy, St.
First Place (Electronically submitted): Dhruv Agarwal, “Don’t Be Nice with the Ice,” Grade 6, Parkway West Middle, Chesterfield, MO. •	GRADES KINDERGARTEN–5TH DIVISION: a congratulatory letter + a purple participation ribbon were each given to 335 chemistry-related entrants this year. The ACS Committee on Local Section Activities (LSAC) is composed of 25 ACS Local Section Councilors from Sections of all sizes. LSAC has a number of programs that support Local Sections to help them “Be All They Want to Be”. LSAC has a number of programs Local Sections can take advantage of and LSAC members serve as resources/mentors for Local Sections that need assistance or fresh ideas. Most of us are familiar with the Annual Report. This report is an on-line report that asks Local Sections to report details of their governance and activities. LSAC members read all reports thoroughly, and provide a review to each Local Section that identifies strengths and suggestions to improve in particular areas. LSAC gathers data from the reports and is compiling Best Practices to be shared with Local Sections. When LSAC notices that a Section appears to be struggling, an LSAC member reaches out to the Section leadership to gather more information and offer mentoring when needed. LSAC has a grants program to support Local Sections. The Innovative Grants program solicits proposals twice a year from Local Sections. The proposal must describe an activity that is new to the Section, and must describe the impact to the intended audience and the Section in general. A detailed budget and plan for continuing funding after the grant period is also expected in the proposal. Funding is up to $3,000 and Sections can submit one proposal per year. LSAC also has “nano” grants available at different times to provide $100 for themed projects. Recent themes included science cafes and promoting interactions with high school teachers. ChemLuminary Awards for Outstanding Performance in Local Sections are awarded each year by LSAC at the ChemLuminary Award Event at the fall national meeting. Awards are given in all size categories ranging from small to very large. LSAC counts on Local Sections to self-nominate for this award, and provide details in the Annual Report to support the nomination. LSAC also sponsors at least two webinars each year, covering topics that are of interest to Local Section members. The webinars are also posted on the “Get Involved” web site, which has extensive information for Local Section leaders and members. To help cultivate new Local Section leaders, LSAC sponsors the Local Section Leaders track at the ACS Leadership Institute in January. The programming is focused on helping new leaders develop successful activities and engage members in their Local Section. LSAC is a very busy committee, whose members work throughout the year to support Local Sections in carrying out their missions. Our national Councilors have reported from Boston, where the 250th national ACS meeting continues through today. As usual, they have provided the document “Councilor Talking Points” that gives a good summary of governance issues raised, discussed, voted on, etc. It would be reckless for anyone to try to select the meatiest, weightiest subjects and summarize them for you. You know better what matters to you. So go, give the Talking Points a once-over and learn what has gone on in your name. •	The St Louis section won two ChemLuminary awards, one for our career programs, and the other for our Senior Chemist event. (There will be futher reportage on these wins in a future post.) We were nominated for three other ChemLuminaries that we did not win: Outstanding Section, Younger Chemists Committee, and high school student activities. With a total of five nominations, we think we have a record for a single year. •	Councilor Donna Friedman was elected to the Committee on Committees. We now have one councilor on each of the three elected council committees. Besides Donna, there’s Lol Barton on the Council Policy Committee and Lisa Balbes on Nominations and Elections. Another outstanding accomplishment!